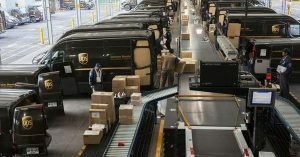 UPS has joined the Blockchain in Trucking Alliance (BiTA), a working group that’s developing standards for the use of blockchain inside the shipping industry. Blockchain tech could help streamline transport by putting shipment data in one place. BiTA’s looking at how distributed ledgers could transform freight shipping. Distributed ledgers use blockchain technology to store and share linked data across several different computers. When data is added to the ledger from anywhere in the network, it’s made available to every other node too. This has direct application to sections of the freight industry. Data on an individual shipment could be added to a centralised ledger and then updated by the parties involved in its transport. Carriers, customs approvals and insurance firms could all access the shipment data using the ledger, perform their role with it and then pass it on to the next party in the chain. According to Business Insider, UPS is particularly interested in using distributed ledgers within its customs business. This is responsible for negotiating cross-border freight shipments that comply with all the local regulations. Introducing blockchain technology could streamline the process by allowing data to be instantly updated and shared. Customers would have an improved experience as they could transparently check on the progress of their shipment using the ledger. Joining BiTA is a sign of UPS’ long-term commitment to blockchain and the ledgers concept. The body is aiming to set the groundwork for the interoperable use of ledgers within the transport industry. If all the members can agree on a standard, future freight shipments could be quicker, more transparent and less labour-intensive. Major logistics firms that don’t support BiTA could find it harder to attract contracts from large clients. If BiTA succeeds, blockchain will become a feasible technology inside the transport sector. Although there’s already blockchain-based transport startups, they currently lack the interoperability and collaboration necessary for the technology to transform the entire industry. Gaining the support of another major logistics provider will help BiTA establish standards for blockchain’s usage.